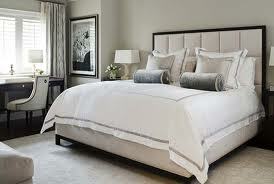 The bedroom is often last on the list when it comes to deciding on a design. But it is a very important space…it can be a tranquil escape from the hustle and bustle of everything, and a room you can really enjoy. To decide which elements are essential to creating a master bedroom that is conducive to relaxation and a good night’s sleep, think of a luxury boutique hotel room. What makes it feel so relaxing and wonderful? 1. 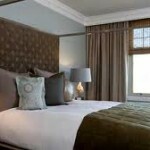 Boutique hotel rooms always feel uncluttered and clean. This is essential to creating calm. 2. There is usually a calming and serene, but contrasting color scheme: dark wood furniture paired with white or light neutrals. Tone on tone…no bright colors or flowery prints. 3. You are surrounded by luxurious fabrics and textures: satin, silk, velvet or suede. 4. They use the highest thread count sheets and the softest, fluffiest pillows. Isn’t it so wonderful to sink into a comfortable bed at the end of a long day? 5. There is a sleep zone and a separate relaxing zone with reading chair(s), additional lighting and small table…a place to rest a book, or a glass of water. 6. There is always a little bling: shiny metals and glass/crystal . 7. The furniture goes well together but is not a matching set. 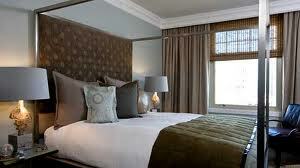 Window coverings don’t match the bedding. There is an element of luxury and sophistication to this style that is very appealing. It is neither masculine nor feminine. It has all the necessary appointments without any of the clutter. Take some (or all!) 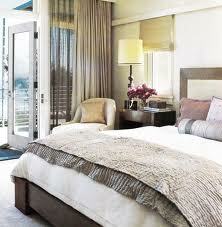 of these ideas and bring the feeling of a luxury boutique hotel into your bedroom!